Hi everyone! 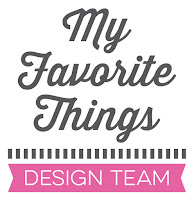 Today is the third day of the My Favorite Things November release countdown. This release is packed with amazing new products and it was so fun to play with all the new stuff! Most of the supplies I used for this project are linked in the list at the bottom of this post. 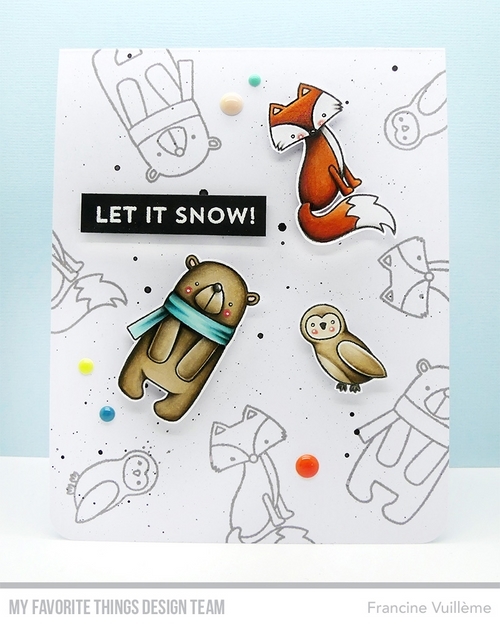 I stamped the fox, the bear and the owl several time on the front of a top-folded card using light grey ink. I then splattered some black ink over the background and left it dry. Next, I stamped the images on white cardstock, colored them and cut them. I adhered the three critters to the background using foam pads for more dimension. The sentiment is from the Snow Globe Sentiments stamp set and was heat embossed on black cardstock using white embossing powder. Really fun design, Francine! Love your selective coloring...so sweet! Very cute card. Love the layout. Great example of how to use the animals in a pattern- the outlined animals make it complete and show off the beautifully colored ones! I love the highlight technique!Awesome card!Thank you for the inspiration! Really creative! I love what you have done here! That's such a fun and lovely card ! I love the outlined animals in the background and the colored ones are popped up! So adorable! Fabulous coloring on the animals!